What should we do on this Spring break? Should we make a tour of a foreign country which is tremendously beautiful and gorgeous, with its culture, its fine scenery and its dishes enhancing the beauty of the country? If so, come to Vietnam, and travel with a professional guide to take you on a wonderful trip. Mr. Nguyen believes that Vietnam is one of the most beautiful countries in the entire world. It’s not only the beauty that brings people to visit Vietnam. But it’s also about its culture, its food and its people. “You will never experience anything else anywhere in the world with its beautiful bays and islands, ancient temples, and its world famous grottoes and caves. It is also full of delicious and tasty dishes,” Mr. Nguyen said. 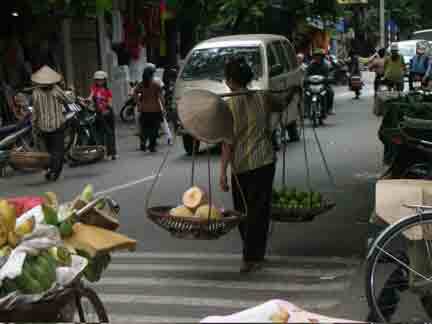 The first place to visit is Hanoi, the cradle of the Vietnamese culture and civilization. “It is not only the capital of the present day Vietnam, but was the capital a thousand years ago, too, “ Mr. Nguyen said. In the year 2010 Hanoi will celebrate its 1000th anniversary. South of Hanoi, along the coast is Hue. “Up to now, there are no places in Vietnam that retain a lot of original historical vestiges as in this old capital city,” Mr. Nguyen. “Hue was a capital of Vietnam under the reign of kings of the Nguyen,” he said. The kings wanted everyone to remember their dedication to scholars of Confucianism. They told skilled masons (builders) to carve many beautiful tablets for themselves and scholars in the Temple of Literature. There are now only 34 tablets of the Nguyen Dynasty of great cultural and historic value remaining. On these tablets were written the names, ages, and places of births of 239 of the most successful candidates in the Nguyen dynasty. 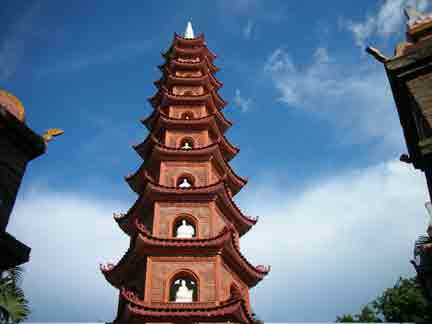 In spite of wars and weather, in Hue there still exist hundreds of pagodas built more than 300 years ago and 1000 temples built in the early 18th century. “In December 1993, Hue was recognized as a world cultural heritage site by UNESCO (United Nations Education, Science, and Children’s Organization),” Mr. Nguyen said. Hue is also an important center of Buddhism. Traveling around Vietnam, tourists should not miss the taste of Vietnamese dishes. The most popular Vietnamese dish is Pho. Pho has been a popular dish for all Vietnamese people since a hundred years ago. Pho is made of beef. Pho may have some other kinds of meat. For the best taste, Pho always goes with beef. If you want to change the taste of beef, chicken can be a good choice. Two types of delicious and very popular cakes with Vietnamese people are Banh Chung and Banh Giay. Banh Giay is a rounded convex cake of glutinous rice, white dough, soft and sticky. At the top of the cake, is a shape said to be the shape of the heavenly vault. “Banh Chung is served during the first three days of the first month of the lunar calendar,” Mr. Nguyen said. It is square cake, wrapped in banana leaves, and tied with lacings of flexible bamboo slivers. It is a very rich food made of bean paste to which maybe added small bits of pork meat, both fat and lean. This filling is pressed between layers of glutinous rice. “Its square shape is considered a symbol of thankfulness of the Vietnamese people to the Mother Earth which helps them with nutritious food throughout the four seasons of the year,” Mr. Nguyen said.